The variety of vegetation types and densities, terrain profiles and soil composition across the globe present significant challenges to deminers. Some of the factors considered in assessing minefields and selecting humanitarian demining methods are below. 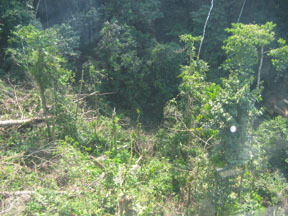 Heavy vegetation in Ecuador can grow back thickly in as little as two weeks, so an areas must be cleared of mines immediately after it is cleared of vegetation. Mined areas that have not been maintained may have several decades' worth of vegetation to negotiate or clear before mines can be removed. 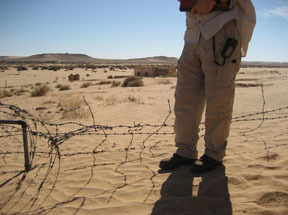 In Tunisia, wind has added up to a meter of sand over parts of a minefield, nearly topping an old barbed wire fence. Landmines can shift placement in soil over time and due to weather conditions; soil type can also pose a challenge to landmine detection and clearance. Sand: Wind can shift sands dramatically, and the fine grit of sandy soils can rapidly wear equipment. Hard or Rocky Soil: Excavating and sifting of soil for mine-size objects is more difficult in hard clay soil or rocky areas. Laterite: Some soils have high mineral content that interferes with standard detection equipment. Steep Inclines: Moving around sites with steep slopes by individual deminers or mechanical equipment can be difficult and even dangerous. 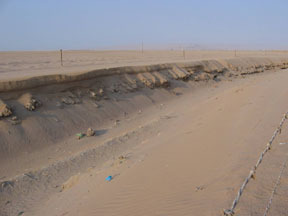 Ditches and culverts can be difficult to negotiate by clearance equipment. Permanent waterways and seasonal wetlands can interfere with standard detection equipment and traditional mechanical clearance methods. Sodden soil is a challenge to equipment traction and can be a particular problem with blast proof tires. Photo courtesy of Roger Hess Demining areas near homes, schools, buildings, railroads are particularly challenging. If mines cannot be removed to another location for disposal, the mines must be burned or detonated at the site. 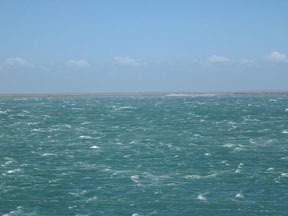 Demining operations were cancelled on an island in southern Chile when winds approaching 90 knots cancelled ferries and helicopter medical evacuation support. At this extreme latitude, deminers operate only during three months of summer. Extreme heat can exhaust deminers and machines. Equally disruptive can be extreme cold and wind. 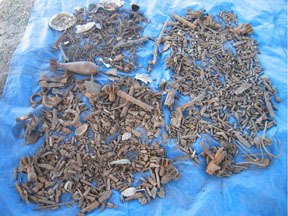 Picture 1: Clutter may include farming and household implements, wire, bullets and casings, remnants of explosive devices. Picture 2: Investigating and removing all metal from a minefield to ensure the area is free from mines can be a daunting task in the minefields of Cambodia, where as many as 350 pieces of clutter are identified for every mine found. Landmines are designed with placement and orientation in mind; however, misguided or inventive users may turn them upside down, sideways, etc., and thereby require modified demining operations. Shifting over time may also occur. There are hundreds of landmine types, and many more copies and improvised mines. Mines can have metal, plastic, wood, or even football casings. Casings and components can degrade over time, altering their detection signature and creating uncertainty as to how mines will stand up to clearance. 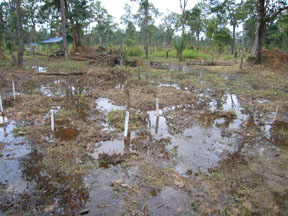 Minefields, especially in former battlefield or populated areas, can have a high number of metallic and other objects in the soil. 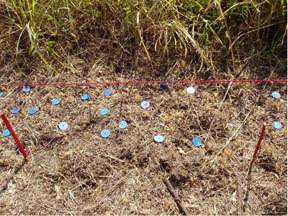 Minefields can be organized in a pattern, which makes for easier removal and accountability; or have random placement. The exact location of minefields and placement of mines are rarely well recorded. Along conflict borders, new minefields may overlap old, and landmines may be deliberately reused and moved by the original or a new party. Newly suspect areas are regularly identified by local residents. For those with records, old reference points (fence, stake, tree or structure) may be obsolete, and modern GPS coordinates must be mapped. 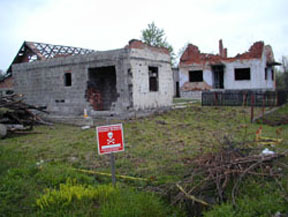 In some areas, groups or locals have reclaimed and reused landmines. 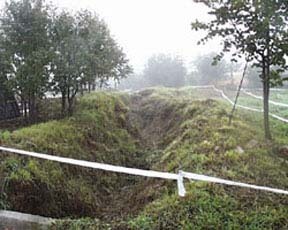 Deeply buried mines (>30 cm) are difficult to detect by conventional methods, and may even be missed by clearance equipment. 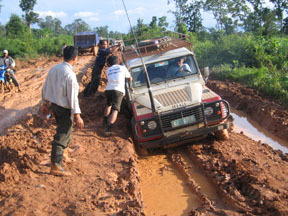 Roads can become impassable for personnel and equipment in Southeast Asia's rainy season. 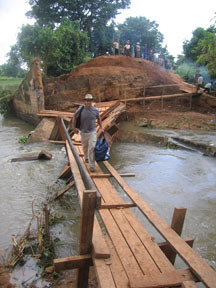 Below, a makeshift bridge in Southeast Asia. Many minefields are remote; the most remote are accessible only by helicopter, posing logistical challenges for personnel, equipment and supplies transport. Roads and waterways may be impassable (totally or for vehicles over a certain weight) due to poor condition, rain or seasonal weather. In addition to road and bridge infrastructure, the limitations of local vehicles and cranes affect the selection of equipment and method of transport. Almost universally two - 20 ft ISO containers are more manageable than a 40 ft ISO container.